This stance has a perfectly legitimate pedigree, as Michael Versteeg and Adam Barkman point out in their chapter in Westworld and Philosophy, “Does the Piano Play Itself? Consciousness and the Eliminativism of Robert Ford.” It derives from the philosophers Paul Churchland and Daniel Dennett, who overcome the old problem of finding a bridge between mind and matter by advancing a thoroughgoing materialism. “Consciousness” is, in effect, a fancy word for what certain really complex nervous systems (ours) do in the course of running themselves. Which is one way of kicking the old Cartesian can further down the road. Westworld doesn’t endorse eliminativism but rather imagines a world in which it is a very consequential idea for the lives of people not involved in the philosophical profession. It also permits and encourages a number of ethical thought experiments: guests are able to commit acts of violence and murder without breaking any law and — what seems more troubling — are free to do so without any obligation to think about the suffering of the androids, however realistic it may be. (All the recreational mayhem of today’s video games, but in person!) A chapter by one of the book’s editors, Engels, draws on Sartre to analyze the effect on one character of choosing to enjoy the simulated death and horror. Another chapter considers the growing awareness and resistance of the hosts in terms of Frantz Fanon’s writings on the violent struggle of colonized people against dehumanization. 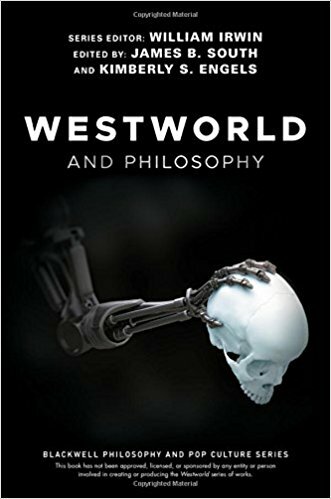 With many of the chapters kindly provided to me for an early look by the editors, the concepts and questions explored were clearly things already on the minds of Westworld‘s writers. The contributors fleshed out the background and the logic of an imagined world in which, as with a car’s rearview mirror, objects may be closer than they appear. Read the rest at Inside Higher Education.